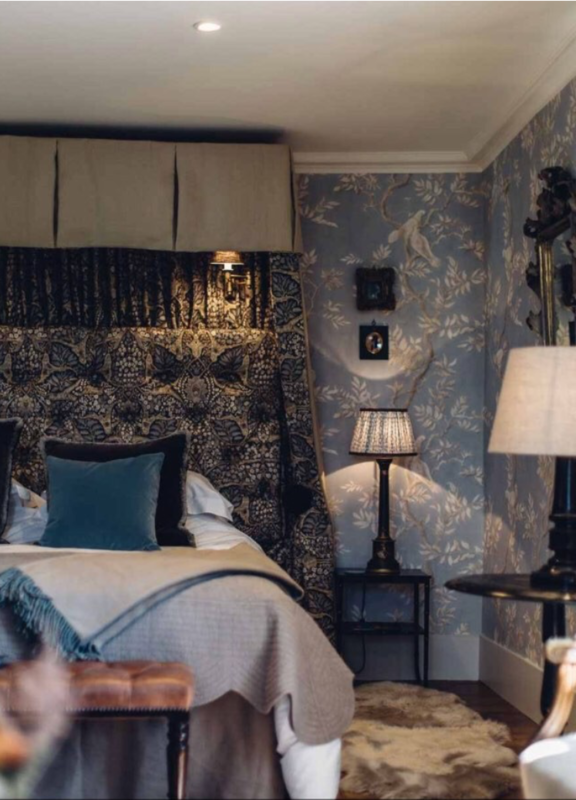 Penned as Leeds Castle’s best kept secret, the privately owned medieval manor house in Kent opens its doors for booking for the first time in its history in 2018. Battel Hall is tastefully refurbished with a gently modernised period elegance, featuring five bedrooms with ensuite bathrooms, three reception rooms and a large dining area. Designer Francesca Rowan Plowden shared her delicious design updates with us, featuring many Jim Lawrence fittings and accessories. Naturally we were thrilled to see our products in such prestigious company, and jumped at the chance to share the images with you too. If you’re looking for a luxurious escape to the countryside – look no further. Whether celebrating a wedding, reunion or an anniversary Battel Hall provides the perfect setting, with the added benefits of the castle estate nearby. It’s a step back in time with a romantic, eclectic twist that we are desperate to enjoy first hand. 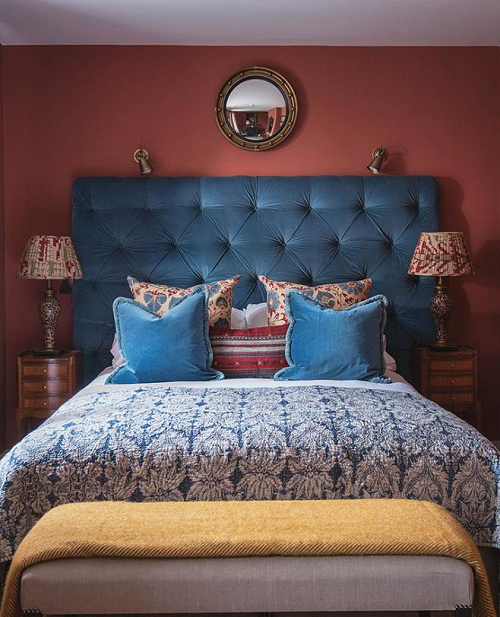 Just look at these beautiful walls and headboard combined with the soft glow of our Hanson wall light. 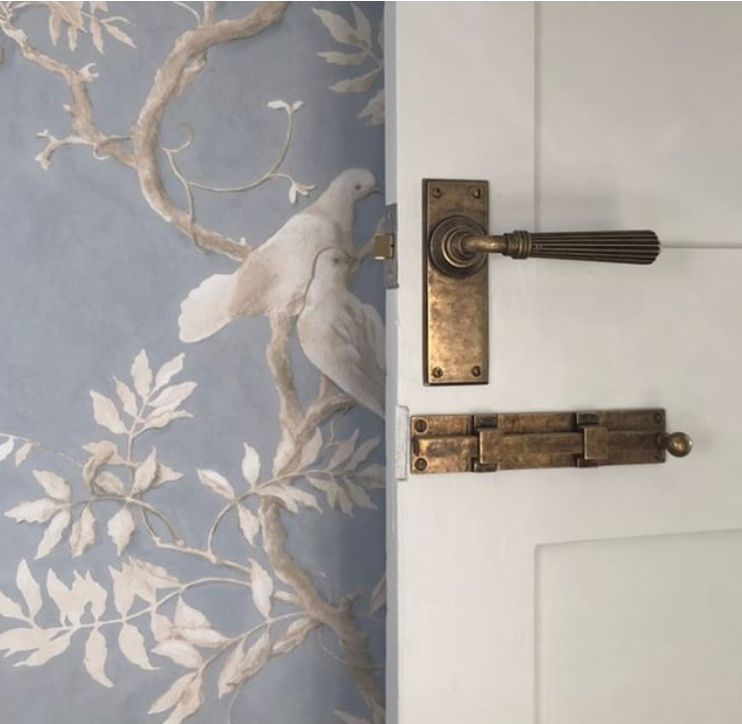 The latest private owner, a 1930’s American Heiress named Lady Baillie, had a love for birds, which is echoed throughout this room in the Lewis & Wood Dove wallpaper. It has an almost fairy tale feel – a perfect escape to dream the night away. 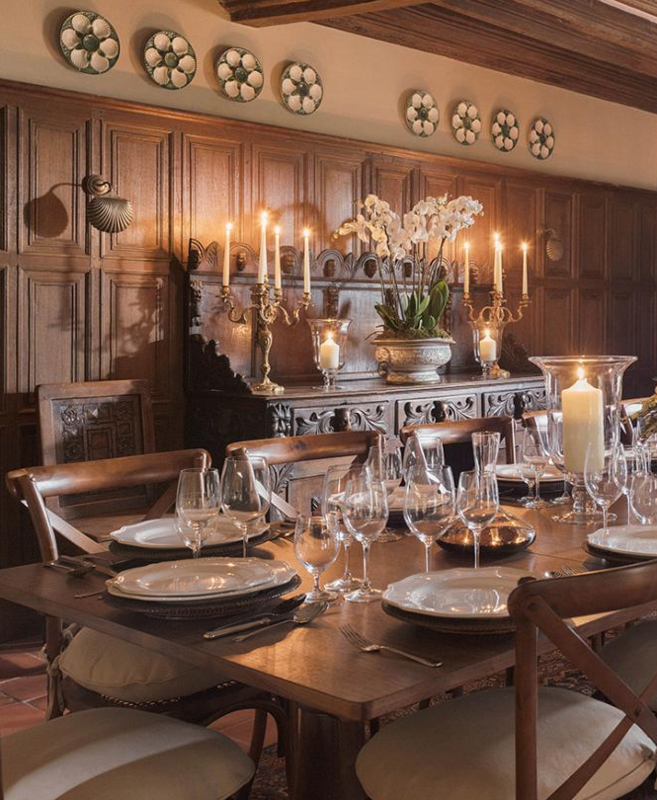 The oak panelled dining room seats up to 14 people, conjuring the images of royal feasts and banquets of times gone by. Our Scalloped Wall Lights are not only a nod to the art deco era of Lady Baillie, but they create a soft and mellow atmosphere: just what you need alongside candle light, an open fire and the gentle clinking of glass and cutlery. Antiqued Brass is a strong and stylish material to sit against the oak – a material which originally came from the castle itself. Ideal for angling as a bedside reading light, the Single Curtis Spotlights sit beautifully in this colourful space. We love the symmetry combined with loud patterns and colour clashes. Farrow & Ball’s Book Room Red creates a dramatic backdrop for our Antiqued Brass finish, and a perfect palette to pop with peacock blue. The Wisteria Suite brings a touch of modernity, its namesake the stunning sprawl of purple flowers that climbs all over Battel Hall. 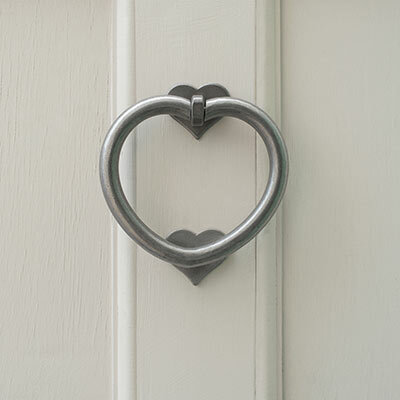 Spot our Stratford Towel Ring? 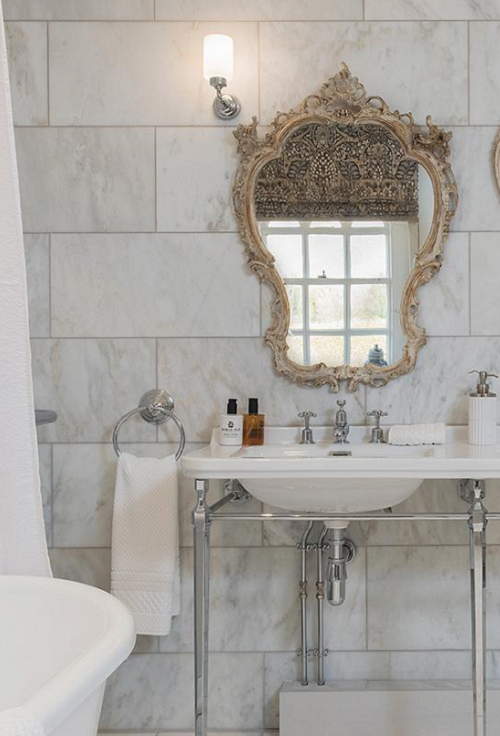 A perfect example of how to incorporate nickel into your bathroom with style. Clockwise from left: Hanson Wall Light in Antiqued Brass, Priory Door Lock in Antiqued Brass, Stratford Towel Ring in Nickel, Bromley Backplate with Reeded Door Handle in Antiqued Brass, Curtis Spotlight in Antiqued Brass, Scallop Wall Light in Antiqued Brass. A thoughtfully designed interior that is respectful of its heritage – something we truly appreciate! For a closer look and a stay at Battel Hall, visit the Leeds Castle website. You can also follow designer Francesca Rowan Plowden on Instagram to see more of her work. 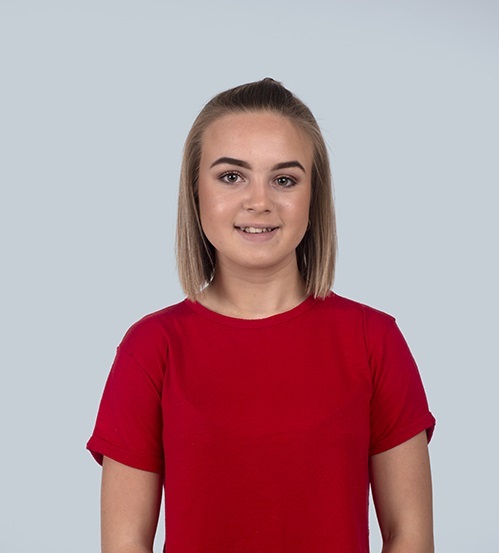 Hi, my names Millie I’m 14 and I enjoy designing and drawing and do a lot of art in my spare time. I also do cheer leading which I attend every week. I enjoy coming up with new creative ideas to show my family! I take Art, DT, Sociology and History at School. When I had my first tour about 6 months ago I was very nervous as I haven’t been to a place like this before! I was a bit scared to come at first as I didn’t know my way round the building, but I easily managed to fit in and all the workers are lovely. Many of us dream of living by the ocean, and if you haven’t, you will now. 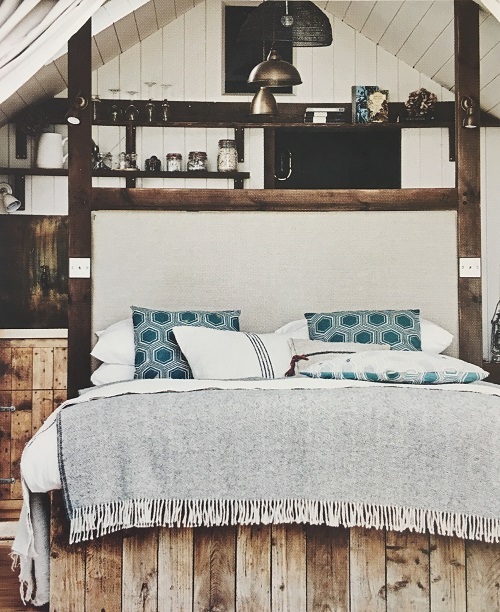 Even a quick flick through Relaxed Coastal Style by Stylist Sally Denning has us lusting after driftwood accessories, flowing linen curtains framing a sea view and worn wooden panelled shacks. 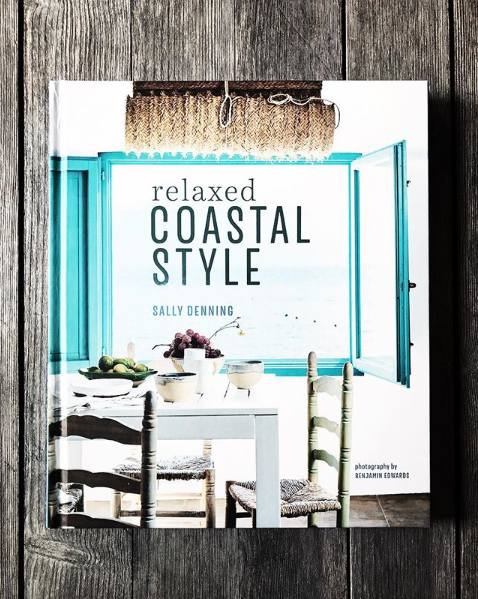 After delving deeper into the beautiful homes that Sally explores in her book, it has us positively besotted with beachside living. A key motif throughout the book is the use of wood. Wooden beams, wooden panelling, rattan furniture, woven baskets and driftwood accessorised into homeware. Think brightly coloured beach huts to washed out window shutters. 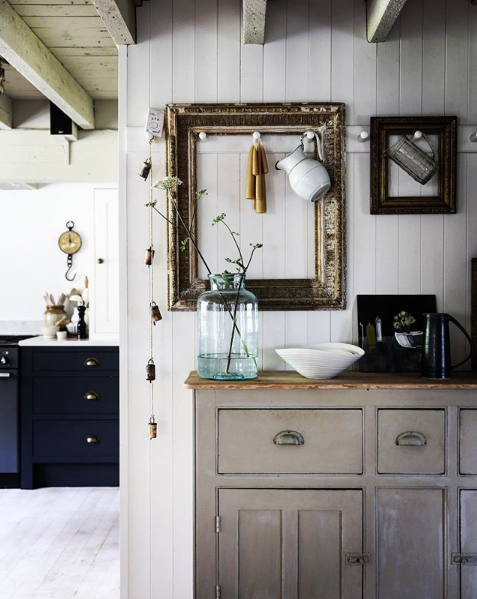 Even if you don’t live in an authentic wooden panelled house, there are many ways you can incorporate this look into your interior décor, such as faux-wood wallpaper, cleverly painted cupboard doors and preloved furniture. 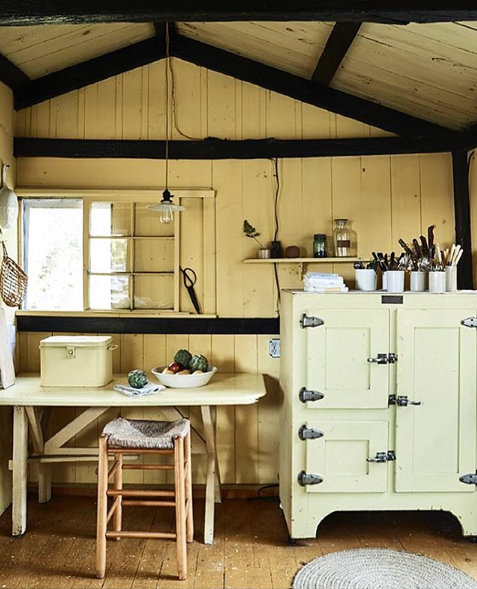 You can boost your external and internal vintage look by adding antiqued brass lighting and accessories like this modern rustic Isle of Sheppey beach hut. Beige, stone and sandy tones come naturally to coastal homes. You might as well incorporate it into the design! There is so much fabric inspiration here, even where you least expect it. Linen curtains and upholstered chairs, textured rope and cream crochet. Even netting. These textures add layers and depth by taking inspiration from the external surroundings – a key step in coastal style. Why not try our range of soft linens as shades or cushions to bring in some texture rich natural tones? A coastal existence isn’t all sunshine and ice cream. Weather-beaten porch railings, rain and rust-stained tin rooves or fading paint and aged metal furniture make up a great deal of this book. Their existence is proof of their steadfast manufacturing, but evidence that living by the ocean can be tough and wearing. This is what we love about this book – the honesty. Sure, your interior can be as glamourous as you like, but it takes a certain kind of person to embrace an old property and make it their own in often remote and exposed locations. It requires great deal of hard work, but the character of such a place is an ongoing enjoyment for those who live there. 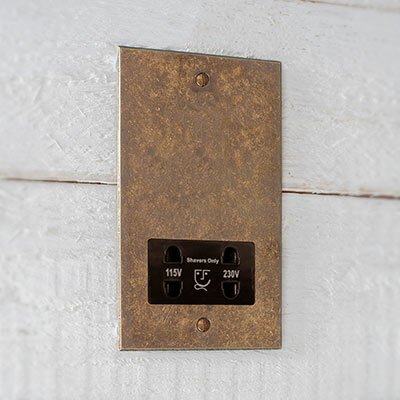 To complete the look, add in other worn materials such as our Antiqued Brass or Polished light and handle fittings – a go to match for this faded look. We’ve cheated a bit here, because this is Sally’s own home (not featured in the book) which is too delicious to leave out. Decorating with the display items in a home can make or break a room. As is evident throughout the homes here, balance is the key. The Instagram hashtag #aquietstyle sums up the softness needed to pull off this look. It is immaculately considered, but executed in an understated manner. It is, in short, relaxed. Or rather it makes you feel relaxed. Using ancient bottles, hand-picked shells and wave-worn washed up glass might sound like clutter to some, but it’s these cherished finds that bring in personality and make a house into a home. For a shell you haven’t had to wash the salt out of, try our beautiful Scallop Wall Lights to bring a soft coastal vibe into your interior. Want to see more? Of course you do. You can order Relaxed Coastal Style, published by Ryland, Peters & Small, through Waterstones or Amazon. For a wealth of interior and exterior inspiration follow Sally’s Instagram @Blackshorestyle. See more by the talented photographer Benjamin Edwards. A special thank you to Sally for featuring our lighting and for supplying the images. 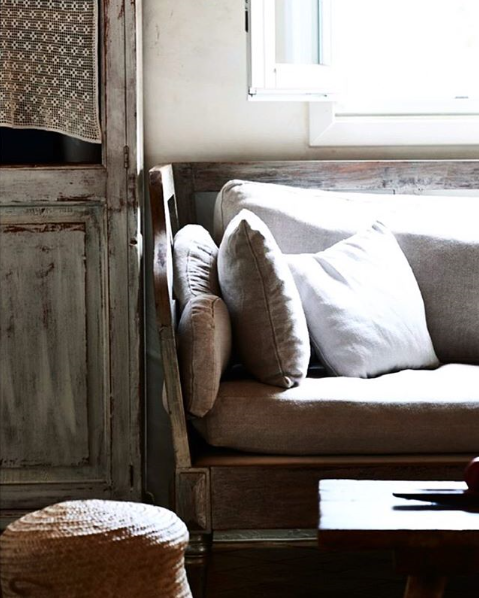 Follow our Relaxed Coastal Style Pinterest board for more laid back décor ideas. Belonging to Suffolk’s prestigious group Stuart Inns, The Old Crown Girton is their first pub located away from the county. 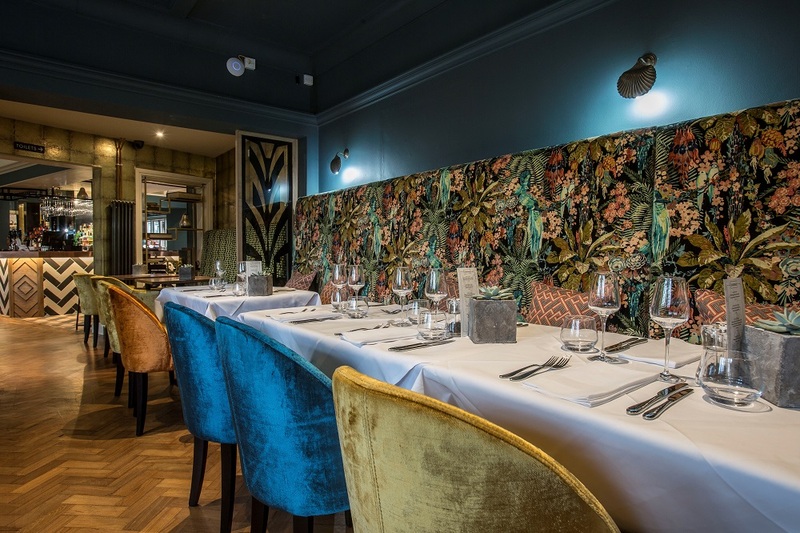 Situated in nearby Cambridge, this beautifully styled bar and restaurant stays in keeping with their well-known sophisticated design. With a little more quirk and a little more colour, we knew we had to explore this venue which features many of our lights. Country homes by their nature are often rather unique and need a thoughtful approach to lighting in order to match their individual character. That’s just how we like them. What do you do when there’s no space for that statement pendant, or when you can’t find a light slim enough for that awkward alcove? Read on to find out in our helpful guide to lighting older homes. Some older country homes can feel quite gloomy if your ceilings are low and your windows small. If you have beams too, this trio of features can contribute to a darker room. Whilst a dimmed space is cosy and snug in the winter, sometimes you want to bring in the sunshine! Here are some tips for when a candle just won’t do. The key is to find a healthy balance. You don’t want to ‘over light’ an area and make it feel artificial. Where it might be difficult to install overhead lighting, wall lights are a fool proof go-to. Otherwise, a mixture of table and floor lamps with dimmers are ideal for altering the atmosphere according to the setting, for example in a living or dining room. We suggest pendants in these spaces too, to bring another layer of light when necessary, and for adding a main point of interest to your home décor. In bedrooms, to retain the warm atmosphere try using low level outlets such as picture lights like our Abercombie, reading lamps or wall sconces for a softer look. Spotlights are ideal for boosting the darker corners of a room. Tracked Spotlights in a suitable ‘older’ finish for your home and work especially well in areas where extra direct light is needed – particularly in kitchens, for example. For when your Dad’s side of the home needs a luxurious update. Gifts aren’t the only way to show you care, but a thought through present can really warm the heart and make someone feel special. We’ve curated a collection of homeware and gifts that are sure to make your old man smile this Father’s Day. 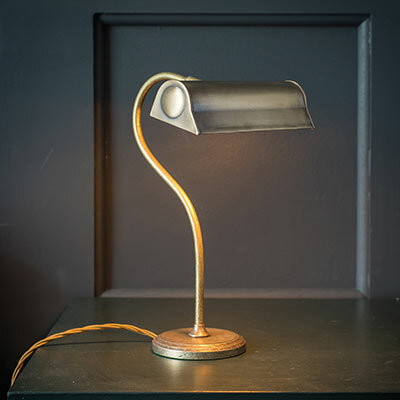 A hand cast, solid brass desk lamp with classic styling. 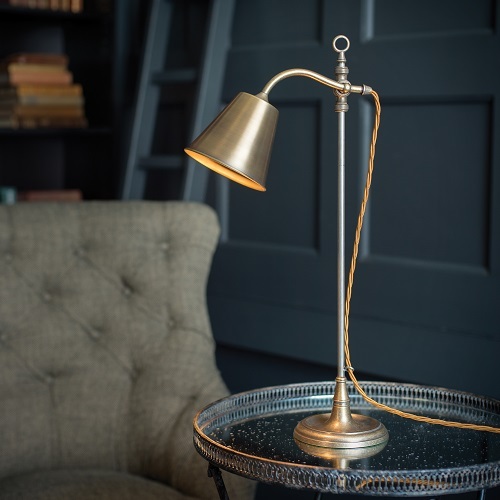 Whether used for reading his favourite book or lighting up a desk space in a workshop, the Peterhouse Desk Lamp adds old timely style to an office or bedroom. Not quite your style? We cater to many preferences with spun shades, glass detailing and even clamped bases. 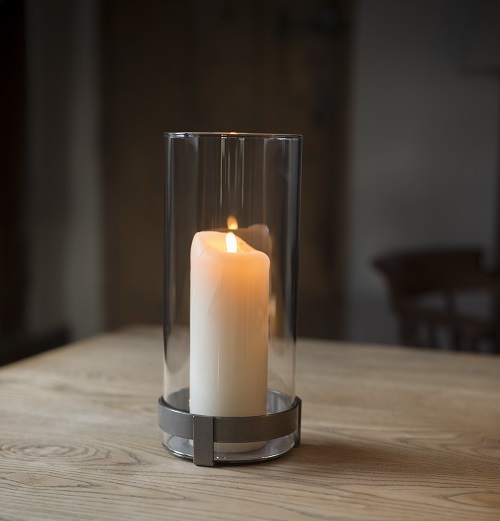 Light up his Father’s Day with a practical but beautiful addition to your home. We don’t know a Dad who doesn’t like a barbecue. 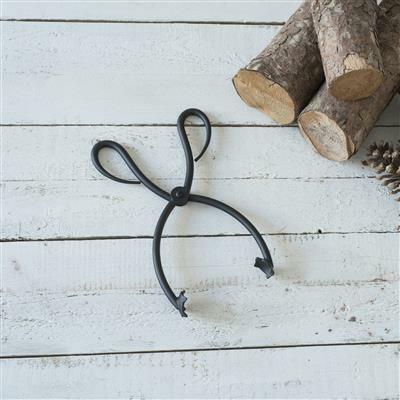 These hand forged fire tongs, supplied in our hardwearing matt black finish, are perfect for stoking fires, coal, and even look great when not in use and on display. Men’s grooming has taken a sophisticated turn in recent years, with quality beard oils and shaving accessories taking the forefront once more. Leather washbags and wooden shaving brushes are returning to the everyday bathroom cabinet and with this in mind, the man in your life needs a shaving socket to match. We offer a range of finishes to suit your bathroom and taste, so choose this hand forged plate and ensure that every part of the morning routine is up to scratch! For the modern country gentleman! Cushions and curtains that everyone can enjoy. Tweed is a perfect match for your brass accessories, and exactly what you need when you want the home to look as smart as you. The predominantly soft green colourway of our new Talisker Lovat Wool evokes a feeling of beautiful Scottish skies, rivers and lochs – a perfect companion for a bottle of Talisker Whisky! A must have garden accessory and perfect gift for your Dad’s, Grandad’s and Father figures alike. 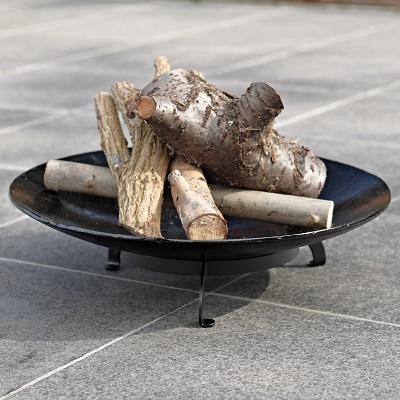 Our hand cast iron fire bowl creates a stylish focal point for outdoor entertaining, as well as a great source of warmth and light on chilly evenings. Something to make memories by. To view all of our top Father’s Day picks, find them in our Gift Section on our website. For more inspiration, home décor ideas and lighting solutions, follow us on Twitter, Facebook and Instagram. Statement lighting is not a new notion, but lighting brands are taking the desire for unique lighting to new heights. With this in mind, we wanted to stay in keeping with our most popular designs whilst bringing our customers something brand new and beautiful. Our hallway pendants are high quality, show stopping lights that are made to wow you and your guests when you enter the room. 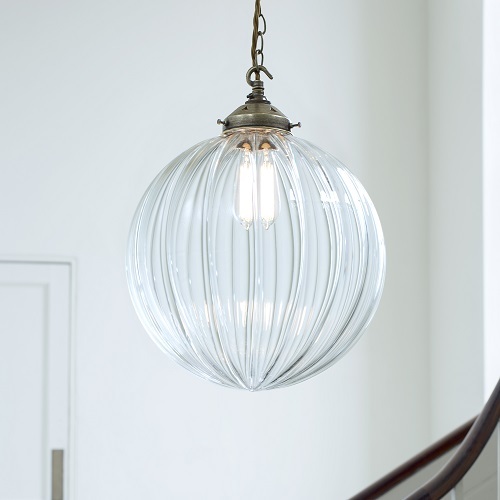 These striking, extra large pendant lights with their individually handmade spherical glass have good looks that may be familiar to you – they are the larger siblings to our eye-catching Fulbourn, Holborn and Ava range. The fluted, tapered glass of our beautiful Ava Pendant Light shines sevenfold on this inspired light, which hangs from a single large ceiling fixture in antiqued brass. 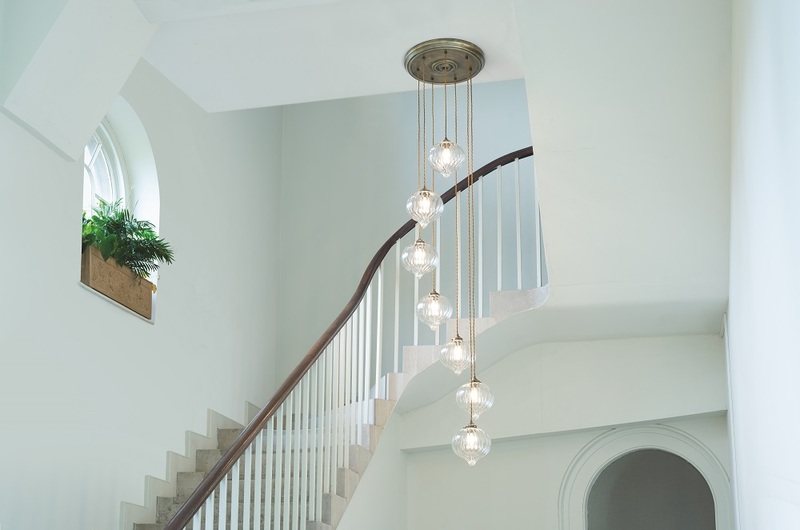 This individually hand made, seven light multi-pendant will look magnificent hanging down a stairwell in a grand hallway or landing. 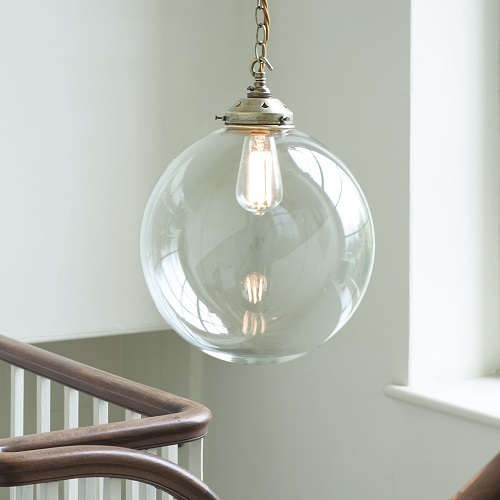 Both made from natural brass, these new globe pendants are treated with a lightly antiqued finish and will add character as well as quality for those looking to make an impact with their lighting. Decide on a fluted Greenwich or plain hand crafted glass with the Richmond for whichever best compliments your interior. Which one will you choose? To shop all of our new products, browse here. 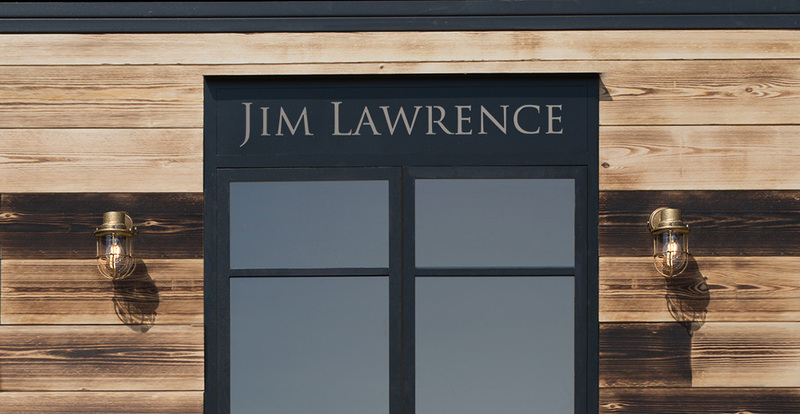 For more interior inspiration and Jim Lawrence updates follow @JimLawrenceMade on Instagram. To get inspired with lighting ideas for your home visit our exciting new pop-up store which will be appearing throughout the UK this summer at some of our favourite country events. This spring we are delighted to be opening our new look pop-up store for the first time at Badminton Horse Trials. Internationally renowned as one of the world’s leading 3-day events it’s one of our absolute favourite shows. This stunning country event is jam packed with lovely shopping opportunities so it’s a great chance to don your wellies, grab the dog and come for a real country inspired shopping trip and day out. To find out more about the weekend visit www.badminton-horse.co.uk. If you don’t manage to catch us at the shows don’t forget our beautiful Suffolk showroom and workshop, featuring over 5000 designs from our range, is open 6 days a week. 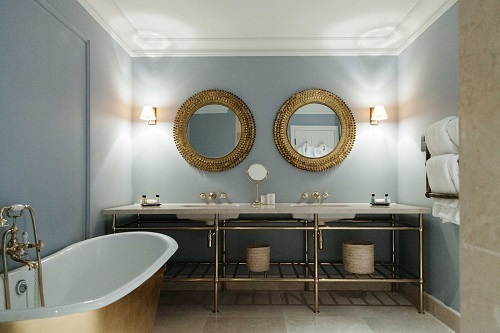 We came across the luxurious and refined Lympstone Manor Hotel through Meraki Design Studio, who have featured our lights throughout this beautiful contemporary country house hotel. 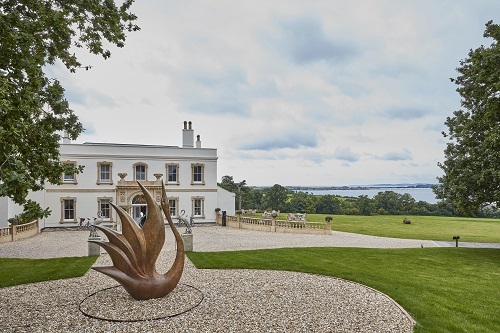 Chef and hotel Patron Michael Caines holds two Michelin stars, and was keen for guests and diners at the Lympstone to experience the exceptional in every way. The beautiful hotel features 3 restaurants and 21 guestrooms boasting panoramic views of the Exe estuary and surrounding Devonshire hills. We spoke to Meraki’s designer Maria about transforming Michael’s vision into a reality, and ways in which you can bring a touch of hotel glamour into your own home.